4th Annual CNY in the Desert to be held at the LINQ Promenade Feb. 20-21, 2015! Jan-Ie Low, Golden Catalyst, LLC. LAS VEGAS – October 8, 2014 – The LINQ Promenade, the Las Vegas Convention and Visitors Authority (LVCVA) and Golden Catalyst are proud to announce that for the first time in 4 years, the Annual Chinese New Year in the Desert/Las Vegas Spring Festival will be held at a new venue. Chinese New Year is the most important of the traditional Chinese holidays and is known as “Spring Festival” in China, “Tet New Year” in Vietnam and “Seol-lal” in Korea. “CNY in the Desert/Las Vegas Spring Festival has grown by leaps and bounds every year and we are thrilled to invite the public to join us in 2015,”said Jon Gray, Vice-President and General Manager of The LINQ Promenade. Caesars Entertainment is redefining the iconic Las Vegas skyline with The LINQ Promenade, an open-air shopping, dining and entertainment district, anchored by the world’s tallest observation wheel, the Las Vegas High Roller. 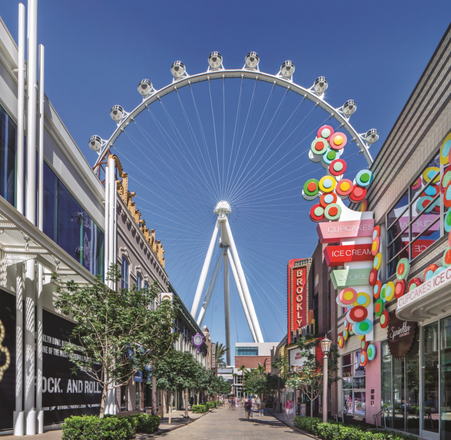 Located at the heart of the world-famous Las Vegas Strip, The LINQ Promenade features more than 30 unique retail, dining and entertainment venues and plays host to a variety of special events, festivals and more. Topping out at 550 feet, the High Roller observation wheel is the focal point of the unique urban entertainment district. The wheel’s 28 glass-enclosed cabins feature an interactive experience including video and music that fade away to unveil spectacular views of the famed resort city in the 30 minutes it takes to complete one full revolution. Each cabin accommodates up to 40 people. Cabins are available for individual or group experiences. For more information, visit TheLINQ.com.